Die Serie Communications in Asteroseismology (CoAst) stellt eine international gefragte Plattform für wissenschaftliche Publikationen der neuesten Forschungsergebnisse auf dem Gebiet der Asteroseismologie dar. Forschungsgegenstand der Asteroseismologie sind veränderliche und pulsierende Sterne. Neben den halbjährlich erscheinenden regulären Ausgaben mit Beiträgen aus der laufenden Forschung werden auch Sonderausgaben für Konferenzberichte bzw. Programmhandbücher herausgegeben. 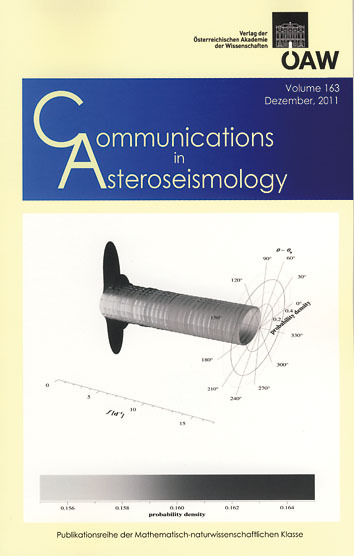 The publication series of Communications in Asteroseismology (CoAst) is one of the most important international journals in the field of asteroseismology. Asteroseismology is the science of variable and pulsating stars. Every six months CoAst publishes a newsletter with papers on ongoing research projects. Besides these regular issues, special issues such as conference proceedings or program manuals are published in this series. SigSpec computes the spectral significance levels for the DFT (Discrete Fourier Transform) amplitude spectrum of a time series at arbitrarily given sampling. It is based on the analytical solution for the Probability Density Function (PDF) of an amplitude level, including dependencies on frequency and phase and referring to white noise. Using a time series dataset as input, an iterative procedure including step-by-step prewhitening of the most significant signal components and MultiSine leastsquares fitting is provided to determine a whole set of signal components, which makes the program a powerful tool for multi-frequency analysis. Instead of the step-by-step prewhitening of the most significant peaks, the program is also able to take into account several steps of the prewhitening sequence simultaneously and check for the combination associated to a minimum residual scatter. This option is designed to overcome the aliasing problem caused by periodic time gaps in the dataset. SigSpec can detect non-sinusoidal periodicities in a dataset by simultaneously taking into account a fundamental frequency plus a set of harmonics. Time-resolved spectral significance analysis using a set of intervals of the time series is supported to investigate the development of eigenfrequencies over the observation time. Furthermore, an extension is available to perform the SigSpec analysis for multiple time series input files at once. In this MultiFile mode, time series may be tagged as target and comparison data. Based on this selection, SigSpec is capable of determining differential significance spectra for the target datasets with respect to coincidences in the comparison spectra. A built-in simulator to generate and superpose a variety of sinusoids and trends as well as different types of noise completes the software package at the present stage of development.